John Maynard Keynes once famously called gold the “barbarous relic,” suggesting that its usefulness and, hence, it’s value, is antiquated. So the question really is, or should be, is gold useful today? If so, what is its value? And how much should you pay for it? In July of 2011, US Fed Chairman Ben Bernanke was asked pointedly whether or not gold was money. He said no. Milton Friedman once famously said, “Money is what money does,” meaning if people use it as a medium of exchange, it doesn’t matter what they call it. For instance, convicts often trade cigarettes for goods and services, so in prison, cigarettes are money. Likewise, for most of human history, gold has been a medium of exchange, albeit with numerous iterations and evolutions — until 1971, when Nixon took the world off of the gold standard, proclaiming, “We’re all Keynesians now.” Many people certainly think of gold as money. Interestingly, governments the world over own large amounts of gold and have recently begun increasing their ownership of gold. My question: If it ain’t money, why would they own it all? Mr. Bernanke says “tradition.” Seems like an awfully expensive tradition to maintain. Maybe there’s more to it. As articulated by a young Alan Greenspan in 1966, gold is the only thing that fulfills all the requirements of money: It is scarce, it cannot be fabricated or produced in large quantities, it is durable, it is homogenous and divisible (so each unit is of comparable quality to the next), and it is widely acceptable as money. Obviously, printed money can’t meet these criteria. Only gold can. Over time, gold has undergone three major transitions: First, it became the global standard as a medium of exchange; second, an international banking system was developed around it, in which paper money was fully convertible into gold; and third, convertibility into gold ceased in 1971 and a purely fiat money system took its place. Global monetary policy “abandoned” gold, yet it trades today at about $1,600 per troy ounce — about 40x its price in 1971, when the US departed the gold exchange standard. How could this be? Just because the world switched to a fiat money system, does not mean that the virtues of gold have changed at all in the past 40 years. Quite the contrary, the virtues of gold have remained the same. It is the political climate that has changed. The hardest thing for an investor to wrap his mind around is that the intrinsic value of gold is not a singular price per se. Rather, gold derives its value as a put on government finances. The more egregious the fiscal and monetary policy, the more valuable gold becomes. The open secret in the financial world is that governments discourage the use of gold as money for its citizens, but in fact they trade in it through their central banks and treasuries. According to the the US Treasury Dept, US Treasury holdings of gold are 261 mm ounces, and the Fed’s holdings were 13.5 mm ounces as of July 2012. Led by governments such as India and China, central banks as a group have been snapping up gold more recently at a staggering pace — increasing their holdings of gold from 156 metric tons to more than 400 metric tons in only 12 months (ending March 31, 2012). Note well, this is a sharp change in behavior from persistent government selling of gold stocks over the past four or five decades. Even the IMF has just reversed a long standing policy of gold liquidation to purchase about 44 metric tons. Of course, ownership of gold is a global phenomenon. As such, gold prices are affected not only by the US Fed’s monetary policy but also by what other central banks around the world do. It is widely believed that the ECB will have to “print” as their end-game solution to save the euro. If so, then the impact of EU printing will magnify the currency wars already taking place as no country wants a strong currency. Until now, the EU has been very cautious about printing money. Should they become a major participant in the currency wars, then they will only add tinder to the flame — accelerating global money printing and the put value of gold. Sources: St. Louis Fed, Gold.org, CFA Institute. As you can see in the table, the monetary base has expanded from $69 billion in 1971 to almost $2.7 trillion today. 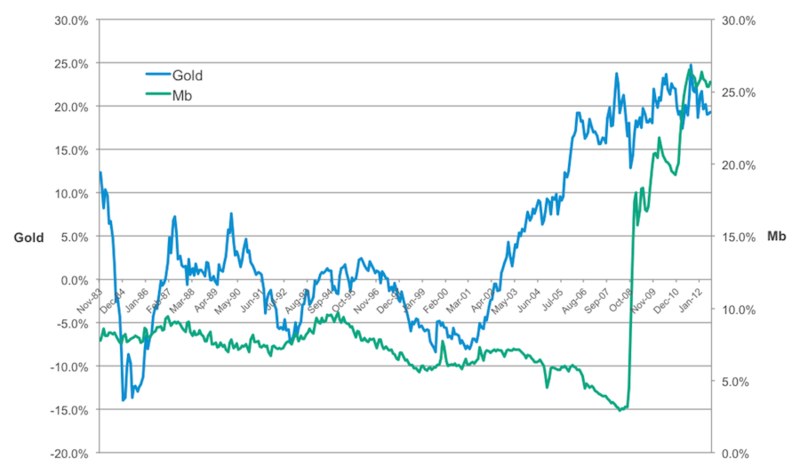 Juxtaposing both gold prices and the monetary base on the same graph is also illuminating. Because of the explosion in debt during the early 2000s, the market was looking through the slowing growth of the monetary base and correctly anticipating that it would need to expand rapidly to cover the bad debts. This is the wisdom of the markets at work. Just as the monetary base expands into a country’s money supply (M1, M2, or M3) through the creation of credit in the banking system, gold is really a hedge against this potential for the monetary base to expand into the money supply. Therefore, looking at the monetary base is a relevant metric for evaluating gold’s potential. Moreover, the central banks have complete control over the monetary base, while they must rely on the banking system and economic growth to produce the money supply (although they certainly have tools to influence credit creation). As noted in my recent article on government debt, governments of the world are trying to solve a debt crisis by adding more debt. This will only serve to ensure that the next recession is severe. But regarding gold, escalating debt levels and fiscal deficits only increase the burden on central banks to print more money. At present, the world is caught in this circular loop of debt and easy money. When the world appears ready to give up on debt and easy money, then you should give up on gold . . . but not a moment sooner. It is a well written article. I only hope that more people read it and understand what is happening around them. In India, even an illiterate person (the numbers of which are reducing every year) knows the “value” of possessing or investing in gold if not the latest price. Gold is embedded in societal and cultural mechanisms. It is a no-brainer. It is probably acquired because of inflationary policies in the past. Even if most people don’t know what economics is they know what rising prices are. I’ve also seen people mistakenly quell this argument behind money printing and linkage to gold by saying that there is also the velocity factor involved in the quantity theory of money. That if it reduces we are still ok. This is happening in the US right now, if I am not mistaken. But people forget that its only for the short term. In the long-term the money percolates through the economy. A piece on how gold has performed in India over the last 30 years vs. inflation and regular fixed deposits held in banks. A collection of charts that illustrate the debasement of the British pound over the last 250 years. They don’t speak, they shout out loud. Thanks for the comment, Kunal! And thanks for the links as well (I particularly liked the price of a kilogram of cheddar cheese example in the latter post – up 37 fold in about 80 years). Running through this article is a confusion of money (without really defining what it is), monetary base, credit growth … , and a lack of insight into why gold, if it is supposed to be some form of money, is so volatile in price compared to a standard basket of goods, as seen in the price of gold adjusted for consumer price inflation (or the GDP deflator). Thanks for your comment. I didn’t delve into too many definitions, but rather linked to other articles/media that explain my points well. That said, I did highlight the relationship between monetary base, money supply and credit. “…. the monetary base expands into a country’s money supply (M1, M2, or M3) through the creation of credit in the banking system…” Regarding volatility, gold is priced in a market – as such, why would you expect it to be stable? Regarding gold as money, it is not considered legal tender officially by governments, but rather unofficially by the people – as it, and it alone, best contains all the properties of money (as highlighted in the Greenspan link). So, its value as money is derived from its unique qualities and perception as money by people the world over. Thanks for your comment! The charts show so well what’s happened post Bretton Woods. And post 1971, when US got off gold, then its a scary fall in purchasing power of the Pound. And the central banks would have you believe that they are doing their best to protect their citizens. Its sad for the prudent savers. Another piece that I absolutely loved.reading. Thanks for writing this article. This kind of knowledge does need to be redisseminated more within our profession. But i do want to point out an error you made, which is so common whenever people attribute that thought to Keynes. So it is the gold ‘standard’ and not gold itself that he suggested was a barbarous relic. The distinction is important to realise. In other words, it is the monetary system that existed prior to WW I that he dismissed as such and not gold itself. Of course, this ‘idea’ was very appealing to sovereign governments issuing fiat currencies. So his idea or gratuitous suggestion gained great prominence in political and banking circles where he subsequently gained great influence, to the point of becoming a dogma followed by most who chose to venture in the field of economics. Unfortunately, Keynes’ mistake caused the going into hiding of all the monetary scientists and as a result we have today the tragic situation where not even investment professionals know what honest money is or what the role or true nature of gold is and why. Louis, excellent commentary. You are right, I glazed over the gold vs gold standard issue – good catch. Thanks for your contribution!!! Hi Ron, your article is very informative but I would more agree with David’s point of view. Post the gold standard was scrapped the gold should be viewed as any other asset class like real estate, equities, fixed income, cocoa, pork etc. and strictly not as a standard scale to the monetary base because the “the gold standard has been scrapped” and this is the fact, however, due to a long period of time it was acting as a standard scale to monetary base and people have very much psychologically not been able to give it up as a standard and it might take some more time before the mass realizes this. If we look at gold as any other asset class and not as a scale to monetary base the current valuations can not be justified by any means. In an economy where the money supply is increasing in tandem with the domestic production and the inflation is under check the inflation adjusted return on capital could be handsome. However if we go by the gold standard theory one should hold on to gold because “monetary debasement is happening”. The real measure of monetary debasement is inflation and the scale is not gold but the over all price adjusted production and the increase in money supply in a period. Any asset which can beat this debasement is a suitable investment and as long as gold has a notion attached with it of being the ideal scale it may continue to move up, but that’s not a rational investment decision but an investment decision based on fear and dogmatism. Hi Saurabh, thanks for your comments! Your response suggests that gold should be priced as any other commodity – which is to say, based on the point where marginal cost equals marginal revenue. For all other commodities, that is fine. But, as I outlined in my article, gold best and uniquely exhibits all the requirements for money. So, at the least, gold’s value is some probability weighting between it’s marginal cost of production and it’s value as money – even if you consider its value and/or usage as money to be remote or unlikely. As reflected by it’s 40-fold increase in price over the past 40 or so years (since the world exited the gold standard), gold demand has increased dramatically. You also state that gold has market-driven pricing, which means that many intelligent, well-capitalized, reward-seeking, risk-reducing investors have gotten it wrong for 40+ years? In a world where markets react almost instantaneously to information and prices are set by the marginal buyer, the gold market has it wrong? For 40 years? I find your argument tenuous that the world simply hasn’t awoken to the new paradigm. One of the key points introduced in my article is that the virtues of gold exist because gold uniquely meets the requirements of money. You appear to be arguing that it has no value in the current system and therefore should be priced as a commodity alone. So far as it is just a commodity, I would agree. But the point is that gold’s intrinsic value as money exists with or without the existing monetary system – because people value it as money. Now, in the future, could it be something else? Sea shells? Rubies? Solar panels? Sure, but whatever it is, it must fulfill the requirements of money and do it better than gold. And given that gold is currently accepted as the global standard as money, it means the new thing – whatever it is – must be so good as to displace gold in the minds of billions of people. It’s just so remote, it is not feasible. In your article you compare the size of the monetary base with the price of gold, which is a bit misleading since the data does not take into consideration the growth in the quantity of gold. What would be more interesting to see is the comparison of quantity of gold vs. quantity of money. Dividing the monetary base by the quantity of gold in both the base year (1971) and the current year (2012) should give you a more accurate reading of the true price of gold. If my reasoning is correct, it will be lower than the quoted market price. If so, the question would be: is gold overvalued? The U.S. treasury and Fed combined holds roughly 275 million ounces of gold or $485 billion at current prices (though carried on the books for only about $11 billion). http://www.fms.treas.gov/gold/current.html. I don’t think U.S. official holdings of gold has increased since 1971 but instead has shrunk moderately. Of course, had the U.S held onto all of its gold post WWII on the onset of Bretton Woods, it would have 2.5x as much or $1.2T at current prices. Compare this to a ~$2.7T monetary base (understated because of Gold’s low mark and likely to rise with QE n+1) and you can understand why past and future increases in the monetary base result in past and future increases in the price of gold. See my post http://www.valuerestorationproject.com/2012/09/qe-n1-what-the-fed-is-really-up-to/ for the logic behind $4,500/oz gold as the proper price for gold IF the Fed sufficiently increases the monetary base to fully reserve for bank loans as has been the standard debt deflationary experience. Thanks JJ! I’ll check it out when I can! I have a diffrent point of view for gold as all of us remember what crude oil did few years back a all time high of 147$ and then a fall of more then 100$ you all know what i feel today that crude is most important commodity compare to others as we all can do without gold but just imagine what will be the condition of our world if there will be no crude tommorow how we will travel or else we all have to move with bullockcarts if there is the end of crude so i compare crude as (BLACK GOLD) so i think every investor should be very careful while investing in gold as i am very much clear when the institutional investor will start selling of gold then there will be no stopping so drive carefully folks! I have seen charts like those elsewhere. Always of course they show some monetary metric such as the aggregate money supply, or global public debt, or some other such metric, with the implication being that there is a causal link between the two. But hey, for a laugh, why not overlay the price of gold with global coffee consumption, or the number of McDonald outlets in Asia, the number of Krispy Kreme donuts consumed worldwide or the total number of computing devices in the world. I imagine the results would be quite similar.